Jesse Ramsden was an 18th century English designer and manufacturer of mathematical and astronomical instruments. He is best known for the design of a telescope and microscope eyepiece (ocular) still commonly used today and bearing his name. He also designed electrostatic machines. Jesse Ramsden, the son of a Yorkshire innkeeper, was born on October 6, 1735. At the age of 16 he was apprenticed to a cloth worker, but in the long run, the textile industry did not interest Ramsden. At the age of 23 he apprenticed himself to a mathematical instrument maker in London and in a very short time, Ramsden demonstrated that he was brilliant and skillful designer of instruments. In just four years, at the age of 27, he started his own business in London in the Haymarket, then moved to 199 Piccadilly in 1775, once his reputation had been established. Ramsden soon became acknowledged as the best designer and manufacturer of mathematical, astronomical, surveying and navigational instruments in England. A few years later he married Sarah Dollond, the youngest sister of Peter Dollond. Ramsden’s inventive genius led to the development of a new universal equatoreal, two new micrometers, and a new construction of eyeglasses. A telescopic eyepiece of his design is still used today. But his most important and well-known invention was a new engine for dividing mathematical instrument scales. Ramsden designed instruments of great accuracy. These included instruments to divide circles and straight lines, sextants, and vertical circles for astronomical observatories. By 1789 he and his workmen had constructed nearly a thousand sextants. He made important improvements in theodolites and transits, invented a pyrometer to measure thermal expension, and a device for determining telescopic powers. He also built barometers, manometers, assay balances, and other instruments. In 1773, Jesse Ramsden of England invented the circular dividing engine, an instrument which had a profound impact on Western history. Prior to his invention, the division and inscription of scales on mathematical instruments was done by hand with an accuracy of no better than 3 seconds of arc, Ramsden’s divider made it possible to inscribe lines accurate to second. Therefore, the value of the instrument depended on the accuracy of the maker and his tools. Instruments such as surveying compasses were subject to wide variations in quality, as each instrument required a maker with an extraordinary control of tools and a very precise eye. Instruments were produced one at a time, which limited the number available for purchase and making them prohibitively expensive. 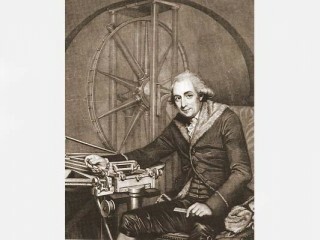 Ramsden’s invention of the mechanical dividing engine, however, eliminated human error and increased the production of precise scientific and mathematical instruments. This was particularly important for the development of the octant and the sextant, both vital to the British Navy. These instruments made the exploration of the world’s oceans and the establishment of the British Empire possible. An octant or sextant enabled a sea captain to determine longitude, which, when mapped against latitude, provided his precise location anywhere on Earth. Ramsden shared in the national prize given to solve the longitude measurement problem. Ramsden Theodolite The evolution of the theodolite began with the description of the instrument included within the book Pantometria, by Leonard Diggs in 1571. After two centuries of adaptations and improvements, the theodolite reached a final basic form in the late 18th century. It was during this time period that a very unique theodolite was built. In 1775 Jesse Ramsden completed his circular dividing engine. This engine enabled much more accurate divisions than the previous laborious and tedious means of manually dividing circles. In the year 1782, it was proposed by British cartographers that the relative locations of both the Royal Observatory in Greenwich England and the Observatory in Paris France, be tied together by means of triangulation, and then the whole of Britain be divided into great triangles. Jesse Ramsden was appointed to build a theodolite that was capable of the accuracy required for such surveys. And so, in approximately 1782 Jesse Ramsden commenced construction on his Great Theodolite. The instrument when completed, (a three year project), incorporated a 3 foot diameter horizontal circle and weighed approximately 200 pounds. It was used by General Roy for locating the Greenwich and Paris observatories as well as the Ordinance Survey of Great Britain. The Great Theodolite continued being used for important surveys and is now housed in the Greenwich Museum in England. Jesse Ramsden was London’s leading maker of astronomical instruments at a time when many observatories were eqiuipping themselves with new and larger apparatus. But scaling-up designs presented the maker with many problems: obtaining brass in adequate dimension, constructing limbs with combined strength with lightness, and finding the right metal for bearings, all of which led to novel instruments. A capacious workshop was necessary to erect and test such apparatus. Ramsden had the space and the skilled workforce, but business often took him away from London; all these matters perhaps explain the delay in completing many of his instruments. Ramsden is best known for originally designing a unique eyepiece for reflecting telescopes. The Ramsden eyepiece reduces blurring of the image caused by chromatic aberrations and is still used to this day in telescopes. Ramsden was able to build achromatic objectives taking advantage of Dollond’s patent, as a result of his marriage to the latter’s younger sister. His astronomical instruments combined the precision of scaled circles with the quality of optics. Ramsden electrostatic machines In the mid 1700s, as the study of electricity became popular, efficient ways of producing electricity were sought. The Ramsden generator was among the first electrostatic generators invented. Electricity produced by such generators was used to treat paralysis and muscle spasms, and to control heart rates. Other medical uses of electricity included filling the body with electricity, drawing sparks from the body, and applying sparks from the generator to the body. Ramsden electrostatic machines were used to charge Leyden jars. To charge a Leyden jar, touch the top of the jar to a static generator, like the Ramsden generator shown to the left. As static electricity is produced, it flows into the Leyden jar where it is stored. Ramsden was elected a member of the Royal Society in 1786 and of the Imperial Academy of St. Petersburgh in 1794. The Royal Society awarded him the Copley Medal in 1795 for his “various inventions and improvements in philosophical instruments.” He was highly respected and became known as “Honest Jesse.” He employed as many as 60 workers but insisted that only work of the highest quality left his shop. His instruments were highly praised by J.D. Cassini, the director of the Paris Observatory. His total disregard for time, however, earned him the animosity of some. The Roy survey was delayed three years at great inconvenience waiting for delivery of the all-important theodolite. Even when the king ordered an instrument from him, Ramsden delivered it, as the king noted wryly, at the right day and the right hour, but one year late! Ramsden was probably the best manufacturer of scientific instruments of the 18th century, well known throughout Europe. He was recognized for his achievements during his life. Ramsden has also been memorialized for his contribution to astronomy by having a crater on the moon named after him. Telescopes and other instruments made in Ramsden’s shop are highly prized by collectors today because of their careful and accurate construction and attention to detail. View the full website biography of Jesse Ramsden.